• Delicious, sparkling–clear drinking water. • Pristine, flavorful coffee, tea and juice. • Cleanly rinsed fresh fruits and vegetables. • Crystalline, harder and clearer ice cubes. • Better tasting soups, sauces and meals. • No more paying for bottled water. • Fresh, clean water, ready at your tap. • Fresh water for your plants and flowers. • Fill your aquarium with clean, clear water. • Provide fresh water for your pets. • Reverse Osmosis gives you the same clear, odor free and great tasting pure water at your kitchen sink for pennies on the dollar compared to expensive bottled water. 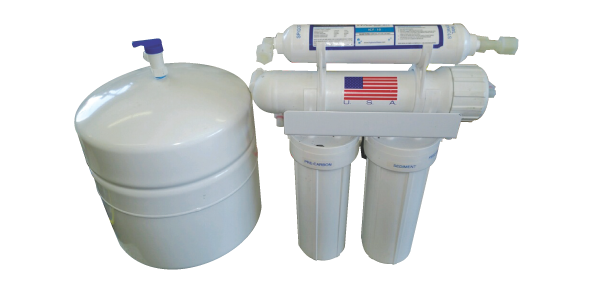 We offer 3, 4, or 5 stage Reverse Osmosis systems that deliver up to 50 gallons of water per day.